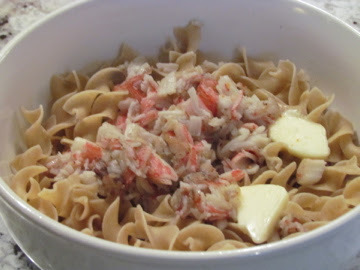 martha.anne - living through creativity: A Pin Attempt or Two - Steak, Crab and Soup! Welcome back Monday! Last night I begged and pleaded to be a stay at home wife, but for some reason the hubby didn't think that was a great idea. Well, needless to say, I made it through the day today and, I have three posts in one tonight... a pin attempt, or two, and a quick recipe that I haven't made in a while, perfect for a quick dinner when you're not in the mood to cook. As I mentioned a few weeks back, I've really been trying my best to eat healthy and as natural as possible... without getting too bored. So, when I was craving a soup for my lunch this week, I thought this would be the perfect recipe, found on Pinterest and taken from manifest vegan. Preheat the oven to 400ºF. Cut the cauliflower into bit sized pieces, lay in a single layer on a baking sheet and drizzle with olive oil. Put in the oven and let them roast until the tops are golden brown, but not mushy, roughly 20 to 30 minutes. Easy, healthy and quick to do. But, not my favorite. For some reason I can't get past the texture and it keeps reminding me of baby food. Now, it does taste okay, just a little bland, but a little salt and pepper will fix that. And... I must admit, it smells really good. So, how about a six or seven out of ten. Hey, give it a try... it may be the perfect soup for you. ... that tastes better than any fancy restaurant. Found on Pinterest and taken from off the (meat) hook. This recipe is easy to do and, trust me, makes the most delicious steak you've ever tasted. Okay a little salty, but I absolutely loved it and would trade in the BBQ any day for this recipe. All you need is a good cut of steak, coarse sea salt and your favorite steak spice. About an hour before you're ready to cook the steak, remove them from the fridge and sprinkle both sides with coarse sea salt, I ended up using coarse salt (maybe that is why it was so salty?). When you're ready to cook, heat a pan as hot as you can get it on the stove, some people use a cast iron pan, I used a regular old non-stick. While the pan is getting super hot, rinse the steaks off and add the seasoning you want for your steak. Now, get ready to cook. Easy-peasy! It takes roughly 10 - 15 minutes and it's absolutely delicious. One of my favorite week-night meals. Okay, enough from me for one night. I think I've made up for my lack of blogging lately. Here's to food, pinterest and a quick rest of the work week. :o) Cheers!